My age will be 68, this year the 4lst year of Showa (1955). Until two or three years ago I had no idea of what my age was. This is simply because I did not want to know, however I do know that I was born in the 23rd year of Showa (1859). I am bewildered by the appearance of my face as it looks now but the reason for this is: I have not looked at myself in the mirror in some thirty years. Even with this bedraggled look I am still what most people would consider an energetic man. If most people were to go for a walk for an hour they would usually cover about four miles - I usually cover that in about half of one hour. I like to walk and do so naturally with my dogs. We walk together everyday. I am very bad for time, but every day I am punctually in bed at 9 o'clock with my pet cat whom I have appointed the name of Jiro. I awake at half past six in the morning and take a cold friction wash. This is something that I have not missed in the past forty years and is why I have never been sick in bed; this is not to say cold washes alone stop you from being sick. I enjoy painting very much and even now I continue painting as a form of play. I am not very skilful but I enjoy it, for me it's a pleasure. No one possesses the knowledge concerning the events of tomorrow; this means we do not know when our life will cease. Due to the impetuousness of youth I made lots of errors regarding my life; this was until the age of forty. I learned my mistakes and now take my cold washes and go for a walk with my dog every morning. After this I dedicate some time to writing and painting, as this is also balance. Exercise, rest, study and pleasure. in the art of ninjutsu. He was already a very old man and after two years died upon my lap forever. I trained in koppojutsu and this training is very difficult. At first you should train fingers and toes using sand. Next you use small pebbles and then a rock, at first your nails and fingertips will flow with blood; it will be very painful and difficult to persevere. I developed very strong fingers and toes from this practice, however this sort of training is useless nowadays and just a little makiwara training is sufficient. I say this because it is very easy to damage the joint causing problems in later life. I started my ninjutsu training when I was thirteen years of age. I began by using a plank of wood 3" thick by 4m in length. I started with the plank at 45 degrees, gradually increased it to 60, then 70 and until I could run up it at 90 degrees. Ninjutsu is not only the art of invisibility. The wide ranged of techniques were only named after a long time had passed. The origin goes back to the pre-history period of the gods. The exact formation is very difficult, as I was not alive then. After I had finished helping my father in his match factory I attended an English school by the name of George Bundow School. I also attended a Chinese culture school. After this I would train with Ishitani sensei in the art of Hontai Takagi Yoshin Ryu, as well as other arts. Seven generations before, his family had been the advisor to the famous Hattori Ninja Army. When I had been training for some time I decided that I wanted to know more about ninjutsu, and myself so I went to a mountain known as Maya-san in Kobe prefecture. At the mountain I lived by a waterfall called Kamenotaki for a period of one year. I stayed in a cottage the size of two tatami mats and lived on beans with no boiled rice. My training partners were the rocks around my cottage. Sometimes I would exercise my finger tips by hitting the rocks. I would jump up on the rocks with my Kiai and then jump off. During this time I developed a special sense. For instance: I could stand at the top of the mountain and know how many people were coming up, I could tell if they were men or women or otherwise. I became known as the "sennin" or "tengu" of the mountain. I went to China during the Chin era and traveled through Mongolia and northern China for a period of about 10 years. During this period I met a Shorinji Boxer named Choshiro. We had a fight and I beat him. We became very close friends, like brothers. This is how I was introduced to the president of the Sino-Japanese Martial arts Association. My memories of these times are a little bit confused, especially the exact dates and times but I do recall that I once decapitated someone. On one occasion I faced and fought a group of mountain bandits, which happened to be members of the local army division. I used ninjutsu on many occasions and was once tried for murder but proved my innocence (self-defence). I recall that one time I was walking through an area known as Santo-sho. It was pitch black and suddenly I could feel something coming at me from behind. I turned to look and saw a huge dog running straight at me. Before I could move he had lunged at me and his head was next to my left ear. He growled viciously but I did not move a muscle because I knew that if I did he would attack me. After a while he stopped, maybe because he knew that this human was not against him. At that instant I hit him right between the eyes with my right fist using my koppojutsu technique. He yelped for a second and then fell to the ground not moving at all. This experience can also be applied against a human attacker. Always be ready for when your attacker drops his guard and then counter attack, without giving any warning or opportunity for a second chance. This is the way I handle this type of situation. I wait for my opponent to attack me and then I just wait for him to drop his guard or make him relax. This is an important point. The sak-ki, or intent to kill, is felt through a system comparable to radar. One who is not able to receive these transmissions will not be able to reach a state of higher quality martial artist. This is what I can guarantee through my experiences, for so many times I have stepped over the line that separates life from death. This, with your techniques, is the line. I once fought a man who was very skilled in many techniques and after I had beaten him we sat down and talked. He indeed knew many techniques and many ways to stop techniques and I have to say that the names alone I would have easily forgotten. Truly he had a large amount of knowledge but this knowledge was wasted in the direction in which it was used. This is an important point when we talk of techniques. We are not talking about moving the body in an exact direction. There is a phrase in the Chinese book of strategy 'UTSU RYU SHI' that says how the victorious soldier is like water. This is because the water is both weak and soft and yet there can be a strong influence on it like a hill - even the hill can be decimated. On the surface it appears like the soft cannot win and yet soft can be stronger. This is like individual techniques; they are strong on the outside but weak within. If you know the name of a bird then you know nothing because this tells you nothing about the bird. The Kito Ryu in the early part of the Edo era was under Fuku No Shichiro Uemon Masakatsu (Yuzen) and Ibaragi Mata Zaimon Sensei (Toshifusa Sozen). Together they founded the Ryoi Shinto Ryu. This was the beginning of the Kito Ryu, then later Ibaragi sensei changed the name to the Ryoi Shinto Ryu. From the fourth generation, Master Takino had a very famous student called Kuki Nagato. This school eventually became known as Kuki Shin Ryu. When I returned home from China my father had taken his 10th wife so I went back to China where I became very ill(tapeworm?) and returned home to Japan. I then went to the Maya mountains. During that time I trained both karate and ninjutsu using my own theories. An old man of whom I know nothing, not even his name or who he was, taught me many things. He made the "to-in" sign together with a kiai and then said after two or three days the tapeworm will be gone. Within ten days he had me walking again. He taught me many things about myself and nature. After that year I thought back and realized that to do anything I needed money and therefore once again returned to China. In China I earned my living by teaching at the English school. I had over 100 students of the martial arts and during this time I taught many people the arts of war, but also taught them the arts of peace. I had many matches against very highly ranked martial artists and of these I did not lose once (although some were called to a draw). I left China having made a lot of money. I later became a monk but have to say that not all religions are good, the people within them become corrupted and then the religion itself becomes corrupted. Sometimes when a crime was committed within my region the police would seek my help in solving the mystery. I was always able to do this and never once failed. Because of my knowledge and practical experience I have often done work for the government. This has only been in cases where it was for the good of my country and our people. Sometimes the work was very hard and dangerous. With the period of change, I was asked to help form the Minoku Seinen Botoku-kai (present day Budokan). There were many masters on the organization mostly from old schools of martial arts. I was elected as president of the association. My official recognition was as a master of jutaijutsu and bojutsu. I have also helped on movie productions and at the theatre I have worked as a technical officer. There are many who try to copy our skill and they do this badly. There are schools of the short stick (jojutsu) but they do not understand what I will tell you. Just as a man (ninja) can and does disguise himself so does the art of the stick. Since the jo is for travelers on the road, it is a means of self-defence. It is not nor has it ever been a weapon or tool of the battlefield. It is disguised as an aid in moving but is for self-defence. 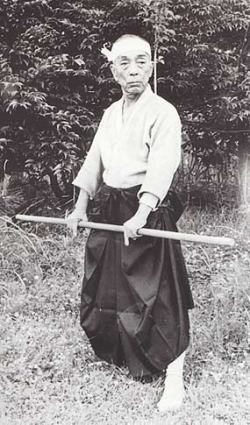 Jo-do is not for self-defence, it is for doing movements with the stick! They are too big and glamorous for self-defence; they have no taijutsu. When I was president of the Seinen Botoku, many martial arts people would ask me if the "Do" was also a method of hiding the true techniques. I have always been honest and had to tell them that the "Do" is very different to "Jutsu" and not of any use save that of learning the dance of the Kabuki theatre. Sometimes you can not find a master of the true arts and then whatever teacher you find will have to do. There are some people who give themselves a certificate of menkyo or higher but it is not the scroll that gives ability; it is one's knowledge of past knowledge. These people surround themselves with government senators and high ranking people of authentic arts to make their own arts seem better. This is wrong. Often they use strength or say they have special powers to win but they loose anyway where it is more important - in their heart. I have had many fights with these so-called masters not only with the body but with words. Two of them even swapped techniques to try and make their own styles but when I pointed out the error of this they denied any such thing. To train you must do so at any time in any condition. I remember my grandfather's training hall was lit by candles and you had to use all of your senses to know who had entered and if they were friends or not. Sometimes we would get ready for training and he would take us outside(in the winter). If you did not have your outside clothes on you would die from the cold so you had to know before. This also teaches bravery and courage. Use all your senses all of the time. You must train like fire because this is how the sword is made. If you sweat, this is like the cooling effect of the forging process. You must keep your vision broad even after practicing a skill for a long time. If you fail to see anything else then your vision will become narrow. If, when training, you think you are not learning then wait ten years and this will change. On injuries; I have had too many to remember them all. If you truly have to fight for your life then this is bound to happen. Old scrolls talk of "katsu" or life giving powers. My teacher Ishitani (Kuki Shin Yo Ryu) became very ill and died in my arms. These skills could not help him as no one has such power. If you hurt your foot or your hands (limbs) then you must use water at different heat. Then you rub into the skin herbs from sweet plants. For the back you can roll on the floor to soften the joints between the bones. Sometimes it is good to have someone rub and push these joints. If you have lots of pain then you must dream about this because your body has the answer on its own. This is the eyes and ears of god. You must drink plenty of water and still train even if you are in great pain. If you cannot leave your bed then train in the mind this is called "sankakujutsu". Some people talk of breathing but I tell you that if you want to control your breathing then it will never become real (natural). When you eat, it is the same with breathing. You do not have to remember to stop breathing when you drink from a cup. Breath is the life force of the body I have heard people refer to it as the power of their technique. If so, I am very pleased for them! If they ever have to fight for three hours it would be nice to see them controlling how they use their air. Too much air will blur the eyes and mind so take care! The eight gates of the ninja are the way to train. I have trained in these for over 70 years and this is the true way.